Android is exploding. The smartphone operating system is growing more popular by the day, and countless new devices are constantly being released, not to mention numerous apps and upgrades, as you can see if you read our Android category. So, how can you keep track of news that is relevant to your own device, or Android news from all over the place? 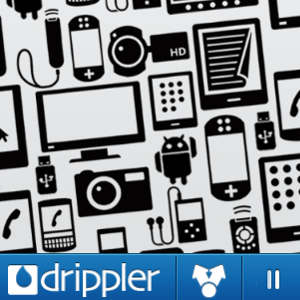 Enter Drippler, a free Android app for doing just this. If the name sounds familiar, it is because Drippler is also a website, which we’ve mentioned before. But the app takes the data on the website and compiles it into a mobile-friendly format, and also automatically detects what device you are using and filters stories accordingly. When you first launch Drippler, it pops up a short welcome message, and identifies your device (Galaxy S II in my case). The app doesn’t include only device-specific news, but also Android-related updates in general. Drippler doesn’t let you subscribe to feeds on your own. Rather, the service compiles and curates stories for you, using their own directory of sources. The Latest tab shows Android-related stories, but also shows the app’s unique device-specific focus. The top story above is about the Galaxy S III, my phone’s successor (I am so getting that device once it comes out). The Read Source button on the top-left of the app lets you get directly to the story, so you can leave a comment if you want to. Note the absence of ads. There are no annoying banners in the story view, nor in the list of stories, making for a distraction-free reading experience. The second tab shows so-called “popular” stories. What’s interesting is that they seem to be sorted by popularity, too. The top story above is from April 29th, followed by one from the 30th, and then one from the 27th. I would be curious to know how Drippler gauges popularity. Is it looking at in-app shares? Or is it using some other API to see Twitter or Facebook shares? The app doesn’t include any explanation or share numbers, leaving us to guess at this. If you’re a Samsung Galaxy II owner and you read just one story about your device this month, that story should be about upgrading to ICS. And indeed, the Monthly page features a top story about that exact point. Unfortunately, that story is followed by two entries featuring the same story (duplicates), again about ICS. So, not perfect, but still useful. The third tab holds the secret as to why there are no banners all over the app – they are all here. But these are highly-targeted banners which would probably be relevant to you. For example, this is a screen protector for my phone, plus I get a 20% discount. Not a bad business model, and I like the idea of concentrating all advertising under one tab of the app. This is one of the more vague areas of the app. I don’t have a Facebook account, and I’m not sure what getting “in sync” means, really. I suspect it is an attempt to get Drippler into users’ social feeds – something I personally don’t like. But then again, that’s why I don’t have a Facebook account in the first place. If you are a hard-core nerd, read dozens of tech blogs regularly, and root and flash your own devices – Drippler is not for you. But if you like to get targeted news and deals for your specific device, curated from a wide range of quality online sources, it’s an app you should check out. We would love to hear your thoughts in the comments. It is an interesting app and I like that it is suited to your device. However, like you, I do not have a Facebook account which prevents me from entering the contest and getting "in sync" (whatever it means?). A big oversight from the developers that I hope will be fixed.